If you have been watching the crescent moon over the past few days, you know that since it passed Venus a couple of nights ago, it slips farther east and is slightly fuller each evening. 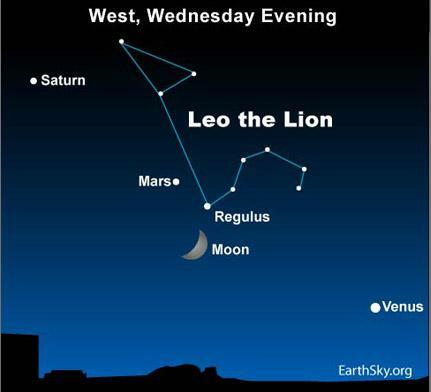 Tonight it is well placed in the sunset sky in the early evening, appearing to pass near Regulus, the “Little King” or “Heart of the Lion,” in Leo. Face the western sky just after it gets dark and you can easily find the lunar crescent, poised silently near Regulus, while Mars stands a few degrees to the south of the star. Do not confuse Mars, which shines with a steady yellowish or orangish light, with bluish and potentially twinkling Regulus. Regulus marks the point of the famed “backwards question mark” of Leo, the great lion of the heavens. If you imagine the question mark as being the back of the head of the lion, and Regulus as his heart (located in the middle of his chest above the front legs), you can perhaps make just make out this great feline as the ancients did. The remainder of his body consists of a triangle of stars. At this time, Leo is oriented almost upside down, facing the western horizon. Interestingly enough, it was not just the astronomers of ancient Greece and elsewhere in the Old World. It is said that Peruvian natives saw these stars as a mountain lion springing on his prey. The moon’s orbit sometimes brings it close enough to Regulus to occult or eclipse it, although this has not happened since May 12, 2008 and will not occur again until December 18, 2016. There is no occultation tonight, but the moon and Regulus draw close enough to fit in the same field of view in many binoculars. Of course you know that they really are not close. A trip to the moon covers a distance equivalent of approximately 10 times around the earth, or nearly 250,000 miles. If you could drive that distance nonstop at 50 miles per hour, it would take more than 6 and 1/2 months. However, Regulus is a large, hot star, surpassing our sun in size and energy. At more than 77 light years’ distance, it is nearly 2 billion times farther away than the moon. A trip to Regulus at 50 mph would take about one billion years! Site contents copyright © 2019 Recorder Online	except as noted. All rights reserved. | 88 queries in 2.087 seconds.